Extreame Savings Item! Free Shipping Included! Save 41% on the RTZEN Judaica - Hanukkah Menorah, Handmade, 9 Iron Branches, Décor Made In Israel By by RTZEN at Wow In The Details. MPN: 2033. Hurry! Limited time offer. Offer valid only while supplies last. Handmade Hanukkah Menorah - Made in Israel by RTZEN-Décor . This elegant and artistic creation will turn your holiday into a festival of lights. Handmade Hanukkah Menorah - Made in Israel by RTZEN-Décor . This elegant and artistic creation will turn your holiday into a festival of lights. Each menorah is uniquely crafted in order to create an amazing, harmonious home experience. It will add warmth and joy to your holiday atmosphere. It can serve as a special Hanukkah gift for your family and friends or as a unique wedding present to your dear ones. 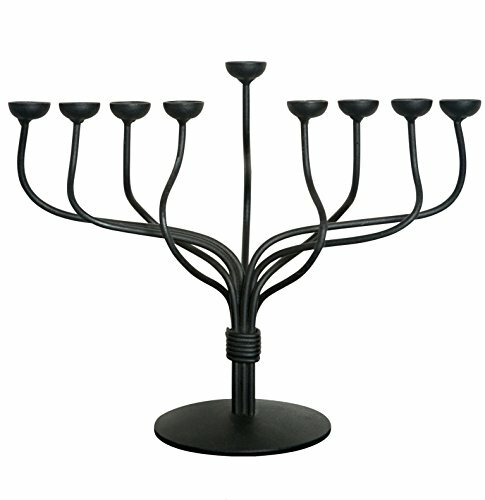 This menorah will also be appropriate throughout the year in providing warmth and stylish look to your home design. Please note that the candles should be attached by heating the bottom part of the candle and pressing it into the cup. At RTZEN-Décor we are dedicated to produce high quality, durable and stylish decorative items. RTZEN-Décor is a one-stop shop for creative and unique quality solutions for your home and office, designed and crafted using traditional blacksmith methods. We truly believe that this form of art is relevant and charming now more than ever, it is both beautiful and functional in modern 21st century homes. Our line of products is suitable for every interior. Our products are easy to install (mounting hardware included), sturdy, durable and long lasting, original and innovative. Fits various candle sizes Made in Israel A kosher Hanukkah Menorah Suitable to various interior design-styles Functional for everyday usage Sturdy & strong Unique hand-craft Durable and long lasting Original and innovative Measures: 4.53'' x 9.45'' x 11.42''"
Unique hand crafted iron menorah, will be the perfect gift for Hanukah or any other celebratory event. The RTZEN Iron Menorah is made to last for generations - start your tradition now! Light up your home in this festive of lights with the 9 easy to clean, wax candle holder. Made In Israel. Kosher Menorah Hanukiah. Measures Size: 4.53'' x 9.45'' x 11.42''. If you have any questions about this product by RTZEN, contact us by completing and submitting the form below. If you are looking for a specif part number, please include it with your message.